The Philips Brilliance 64 is one of the most advanced, powerful and versatile systems on the market today. With its 64-channel configuration, this system is capable of handling cardiac, trauma, pulmonary and pediatric imaging applications. The Brilliance 64 CT has four times the amount of detectors as a conventional multi-slice CT system. With the Brilliance 64, you will receive not only great image quality, but you will experience remarkable speeds as well. The Brilliance 64 can cover around 4 mm at a single pass in as fast as .4 seconds, and the patented MRC X-Ray tube helps eliminate waiting time between sequences. This scanner produces sharp, detailed images of any organ you scan in only a few seconds, including 3D images. 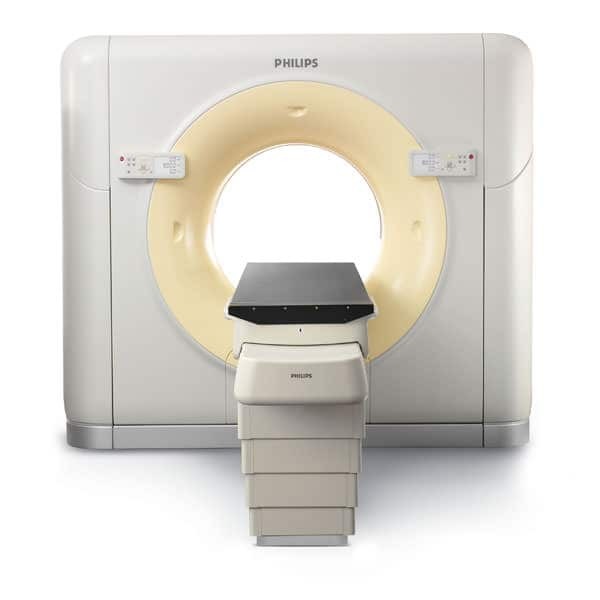 The Philips Brilliance 64 will broaden your horizons in cardiac imaging. The 64-slice configuration allows for breakthrough performance in advanced pulmonary imaging and multi-organ trauma evaluation.